Is it me, or is the music your parents listened to when you were growing up really polarizing? I either love it or I hate it! Thankfully, when it comes to the tunes of Creedence Clearwater Revival, my dad and I never disagree. In fact, the first time he showed me the photo of lead singer John Fogerty and the crowd from inside his vinyl copy of CCR’s Pendulum album, it took me less than thirty seconds to find his face near the front of the crowd. Naturally, when I heard that Fogerty was playing all his best at UC Berkeley’s Greek Theatre, I could think of no one I’d enjoy the evening with more than my dad. And tonight, that’s exactly what we did. He wrote a song for everyone, and played them all for Berkeley. Crossing this show off my bucket list made me feel fortunate…son. Next came “I Heard it Through the Grapevine,” featuring great mini solos from the band, which consisted of a key player, the aforementioned great drummer, and a total of four guitars. After “Long As I Can See the Light” came the wonderful “Put Me in, Coach” featuring a baseball-themed video montage (Fogerty is admittedly a die-hard Oakland A’s fan). 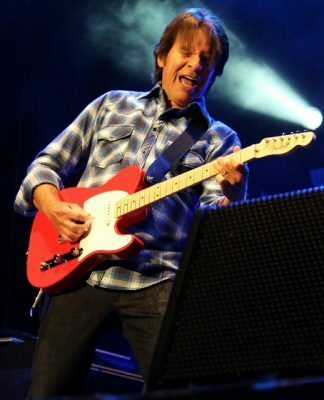 Fogerty shared more childhood memories, explaining that when he was really young, his parents used to take him to a place in Northern California near Winters called Putah Creek, which eventually became Berryessa. He recalls his dad driving them through Monticello and saying “son, someday that’ll all be under water,” having no idea that he’d be right. 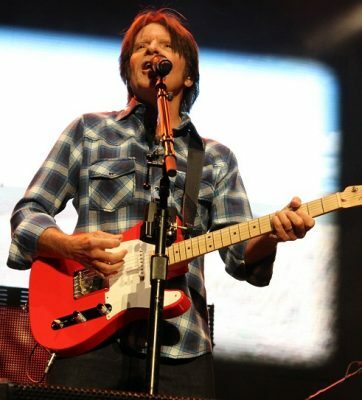 “I wrote this song about those days,” he said as he began to play “Green River.” Next came a song neither Dad nor I recognized, and then Fogerty spoke about working on his current album, Wrote a Song for Everyone, which features notable guest performances by Foo Fighters, Miranda Lambert, Bob Seger, and Fogerty’s own sons. (“Who have their own rock and roll band.”) With his sons, he recorded the next song, “Lodi” at Abbey Road in London. “Mystic Highway” followed while the song’s video rolled on the screens. 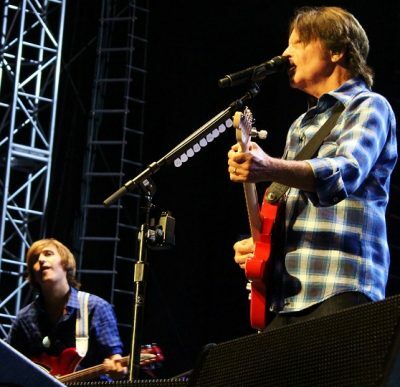 Shane Fogerty, L, plays guitar on tour with dad. “God bless ya for singin’ along, thank yoooooouuu!” A cover of Roy Orbison’s “Oh Pretty Woman” was next, and all I can say is what I typed in my notes: so damn fun! There isn’t much else to say. My all-time favorite CCR hit was next, “Down on the Corner,” and then “The Old Man Down the Road,” featuring a great little jam between father and son. “Fortunate Son” featured a video tribute to America and its vets (shots of American flags, veterans coming home, and the like), and concluded the full set. 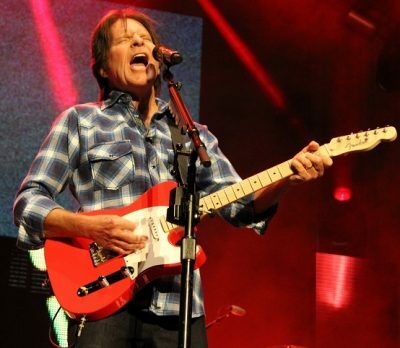 The encore began almost immediately, with Fogerty pointing at the crowd in obvious appreciation for their enthusiasm. “Hey, Tonight” was first, and then Fogerty said, “folks, I just want you to know how much I – we – appreciate such a great audience. God bless ya, rockin’ out, havin’ a great time with us!” Classic hit “Bad Moon Rising” came next, followed by finale “Proud Mary,” which quite simply blew my mind: it was the cherry on top of a delicious sundae I’d order again in a second. I don’t often get to take my dad to shows with me. The last show we really enjoyed together was a fantastic Stevie Wonder show years ago, and we still talk about it. Not only do I know that will be the case with tonight’s John Fogerty show, but it’s something I’m now happy to say I can cross off my bucket list. My dad said he expected someone of Fogerty’s age and success to be in it for the money by now, and was very happily surprised to discover that he’s wrong: this guy still loves what he does, and does it for the joy of it. Take lessons, young musicians. Because that, my friends, is how it’s done.